Sunset photo taken the other day by my husband Brad Klopman. I began my blog almost nine years ago, April 17, 2009. (Tech is like dog years, feels like 63 years ago.) I remember it well. I sat outside on my front stoop in LA, sun in my eyes and Kansas (my then dog) rolling in the grass beside me. It was early in the blogging world. I remember trying to figure out "how to create a blog." It was exciting and challenging. I had no idea what I was doing and I certainly didn't know what I was going to blog about. All I knew was that I had an urge--a desire to share information and to connect with other like-minded folks (social media was just becoming a thing). It felt soul-baring. In his autobiography "My Experiments with Truth", Gandhi says, "Writing (this autobiography) is one of the experiments with truth. One of its objects is certainly to provide some comfort and food for reflection." My blog was definitely an experiment. I was constantly thinking about it, juggling sometimes how far to push it, yet wanting to serve the causes I was passionate about, as well as my own truth, and my dear readers. I hoped, as Gandhi said, to provide some comfort and food for reflection--not just for my readers but, honestly, for myself. Blogging made me feel less lonely. And that was important for me in those years. To those of you who have followed my blog, thank you. Above all, I hope my posts have in a small way been a source of something good in your life. Maybe you even found a new favorite vegan thing! Though I will continue my experiments with truth in other formats, it is the end of an era for me. I have deleted 95% of my posts--hundreds of them--except for a few that still mean something to me or still garner attention. I wrote a post called, "How I Healed a Pinch Nerve in My Neck" that gets a hit every couple of minutes from all over the world. It has 80 comments and I've received countless personal messages about how this post has helped someone out there. It's beyond gratifying to know that post has been and continues to be of service to others. Today I am determined to see things differently. Truth be told, I wake up every morning and say that. I figure it's like the daily spoonful of glucosamine I give my dog Kansas for his bad hips. I don't really notice he walks any easier, but I trust that over time it's having some effect. PREFACE: I've been obsessed with the moon since before I knew it was written in my name. My middle name is Selene, which in Greek Mythology is the "Goddess of the Moon." Selene was also known as Cynthia, because she was born on Mount Cynthus. I don't think my dad knew this when he named me Cynthia Selene, but I'll have to check. On top of all that, the moon rules the subconscious, which I'm also obsessed with, being a hypnotherapist. So that's a long-winded way of saying here's another moon post. We haven't seen a Supermoon this super since 1948! Tomorrow, Monday November 14th, the moon will be the closest it's been to earth since most us have been alive. (It will be closest and fullest at 8:52 a.m. EST.) The moon has a deep subconscious effect, we can see its power in action by the powerful ocean's changing tides. This Supermoon is stirring things, and that makes it a great time to stimulate the change you desire in your own life. (We will continue to feel the moon's energy a couple of days before and a couple of days after.) Here are five Supermoon rituals to align yourself with this opportunity. This particular Supermoon is in Taurus, which rules money. Meditate on opening yourself to receive more money. Repeat "I deserve money." Or "Money flows to me." Or "I am abundant." Just pick one and repeat it all day long. As a hypnotherapist, I prefer simple, short affirmations. If you have enough money, meditate on how you can be of service to the world with your money, or affirm, "I use my money for the good of all." A Supermoon is the beginning of a new phase. What better way to make room for the new than to release the old? Clear out clutter; throw away or donate clothes, books, housewares you don't need; give worn sheets, towels and blankets to an animal shelter, release a friendship that doesn't serve a higher purpose for you anymore, drink more water so you pee out more toxins, you get the idea. Just clear the way! This Supermoon is coinciding with the winding down of our 2016 calendar year. Take a moment to write in your journal (or iPhone) your desires for the rest of this year. What do you want to accomplish before year's end? What do you need to do to achieve that? Who do you want to be in 2017? I love to smudge! Smudging is the use of dried sage sticks to cleanse and clear the energy of your home/office/car/wherever. (Purchase here on Amazon, just in time for tomorrow.) I smudge about twice a year. The Supermoon is a very favorable time for smudging. Pick out your favorite quartz crystal. What? You don't have one?! Okay, I've got you covered. Go here and buy some on Amazon Prime to be delivered tomorrow (and if it's the next day, that's fine too. Moonbeams will still be in effect from the Supermoon energy). Once you have your crystal(s), run it under cold water and then set it in the moon's light overnight to be supercharged. It's kinda magical. Once charged, place it on your nightstand while you sleep or hold it as a meditation stone. I like to put them all around our house. If you prefer rose quartz, you could purchase a little pyramid like this. Or indulge in a necklace to wear. Not into crystals? No worries! Bathe yourself in moonbeams. Is it private enough and warm enough where you live to sit outside (preferably naked or semi-naked!) and soak up the moon's energy? Then that'd be amazing, and definitely what you ought to do! If not, just let the top of your head and your face soak in those good moonbeams. We have so much support! The universe is on your side urging you towards healing, growth, greater wellbeing and success, and Mother Nature bends to kiss your forehead, blessing you with everything she has. Spend a moment in gratitude for what you do have, and open yourself to what you could have. This summer I got rid of about 97% of the plastic in my kitchen. It's something I've been wanting to do for a long time. Google the dangers of plastic and you'll come up with a half million results. It's no secret that plastics are at best questionable for our health. This isn't some hippie idea, it's serious enough that leading scientists, top research schools like Harvard, global environmental organizations, EPA programs, medical organizations and more have done research into the harmful effects of plastic. We can't avoid plastic. It's so ubiquitous we don't even notice it. 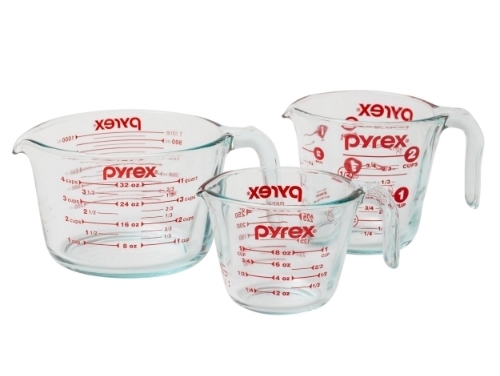 Even though it's only really been in daily use, like in dishes, since the 50s. It's still too early to fully understand the daily effects of our modern reliance on this toxic chemical known as plastic. But we do know that BPA (Bisphenol A) is one of the most pervasive chemicals in modern life. BPA is a building block of plastic and is used in thousands of consumer products, including food packaging. It's one of many man-made chemicals classified as endocrine disruptors, which alter the function of the endocrine system by mimicking the role of the body's natural hormones. Creepy stuff with adverse consequences, like obesity, breast growth in men, early puberty for girls, breast and prostate cancers. Many plastic additives have been banned across Europe, Canada, and China, surprisingly. There's sufficient evidence to make you scratch your head, and perhaps think "Maybe I don't need all this plastic in my life." I can't control every piece of plastic I come in contact with, but I do have control over what I put in my mouth and on my body and in my home. I can limit my exposure to plastic, and make choices that align with what I value. By the way, I am of the belief that fear is one of the greatest killers. No fear mongering here. I promise. Just good old-fashioned pre-plastic common sense. It's important to find a balance between being practical, living normally, listening to your own inner guidance, heeding health warnings, but also not caving to fear. I don't live in fear of plastic, nor should anyone else. But that doesn't mean it's good for us. Just like I would get rid of black mold if it was growing in my house, I am getting rid of unnecessary plastic, particularly in my kitchen where it comes in contact with what goes into my, and my family's, body. I actually found it liberating to get rid of most of the plastic in my kitchen. It felt like I was taking back a part of my life in some strange way. 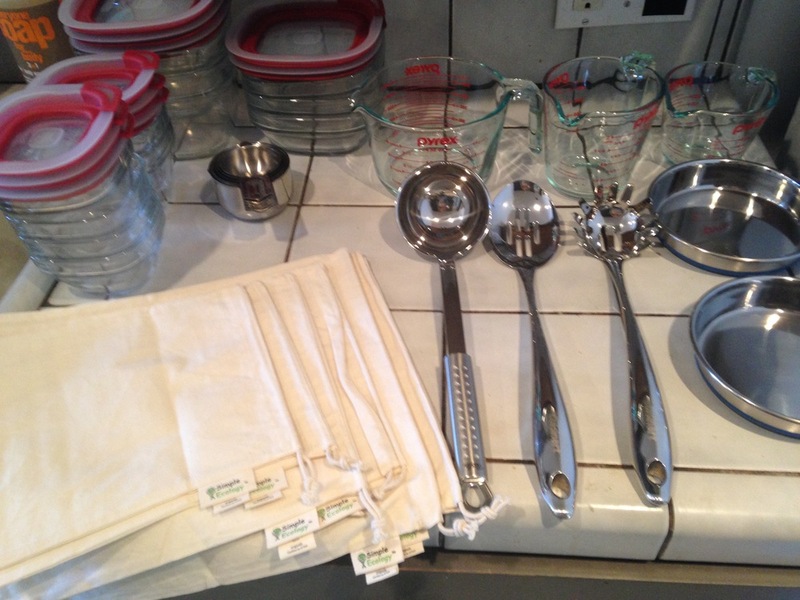 I couldn't believe the copious amounts of plastic I had tucked away--food/storage containers, cutting boards, measuring cups, dog and cat bowls, cooking utensils and more. But when it came time to let go of some of the bowls I've always liked, it wasn't easy. I replaced what I wanted with metal or glass. I searched high and low for an all glass storage container set, but couldn't find one. So I bought this set below on the left with the red lids. The lids are BPA-free (when you buy plastic look for BPA-free) but my husband and I are still careful to not pack them so the food touches the lids. We love this set. I'll include a link to some of the things I purchased below at the end of this post. I love these 100% cotton food storage bags! I hope this has inspired you to at least reconsider the plastics in your kitchen, which I think, is the most important place to start. We can't do everything, but we can all do something. And sometimes, that's enough. Here are some of the things I bought. And I can honestly say I would purchase them all again. Great products all around! I've linked the titles to their Amazon page. Happy BPA Plastic-Free Zoning Your Kitchen!